Japanese are not just known because of their food, cosmetics, anime and many others. 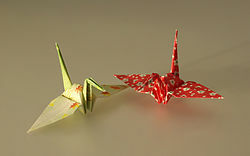 Japanese are also known through origami. Origami (折り紙?, from ori meaning “folding”, and kami meaning “paper”; kamichanges to gami due to rendaku) is the traditional Japanese art of paper folding, which started in the 17th century AD at the latest and was popularized outside of Japan in the mid-1900s. It has since then evolved into a modern art form. The goal of this art is to transform a flat sheet of paper into a finished sculpture through folding and sculpting techniques, and as such the use of cuts or glue are not considered to be origami. Paper cutting and gluing is usually considered kirigami. Many books have published many origami techniques that are easy to follow especially the beginners. These include simple diagrams of basic folds like valley and mountain folds, pleats, reverse folds, squash folds, and sinks. There are also standard named bases which are used in a wide variety of models, for instance the bird base is an intermediate stage in the construction of the flapping bird. Additional bases are the preliminary base (square base), fish base, waterbomb base, and the frog base. Almost any laminar (flat) material can be used for folding; the only requirement is that it should hold a crease. Origami paper, often referred to as “kami” (Japanese for paper), is sold in prepackaged squares of various sizes ranging from 2.5 cm (1 in) to 25 cm (10 in) or more. It is commonly colored on one side and white on the other; however, dual coloured and patterned versions exist and can be used effectively for color-changed models. Origami paper weighs slightly less than copy paper, making it suitable for a wider range of models. Normal copy paper with weights of 70–90 g/m2 can be used for simple folds, such as the craneand waterbomb. Heavier weight papers of (19–24&nb 100 g/m2 (approx. 25 lb) or more can bewet-folded. This technique allows for a more rounded sculpting of the model, which becomes rigid and sturdy when it is dry. Foil-backed paper, as its name implies, is a sheet of thin foil glued to a sheet of thin paper. Related to this is tissue foil, which is made by gluing a thin piece of tissue paper to kitchen aluminium foil. A second piece of tissue can be glued onto the reverse side to produce a tissue/foil/tissue sandwich. Foil-backed paper is available commercially, but not tissue foil; it must be handmade. Both types of foil materials are suitable for complex models. Washi (和紙?) is the traditional origami paper used in Japan. Washi is generally tougher than ordinary paper made from wood pulp, and is used in many traditional arts. Washi is commonly made using fibres from the bark of the gampi tree, the mitsumata shrub (Edgeworthia papyrifera), or the paper mulberry but can also be made using bamboo, hemp, rice, and wheat. Artisan papers such as unryu, lokta, hanji, gampi, kozo, saa, and abaca have long fibres and are often extremely strong. As these papers are floppy to start with, they are often backcoated or resized with methylcellulose or wheat paste before folding. Also, these papers are extremely thin and compressible, allowing for thin, narrowed limbs as in the case of insect models. Paper money from various countries is also popular to create origami with; this is known variously as Dollar Origami, Orikane, and Money Origami. It is common to fold using a flat surface but some folders like doing it in the air with no tools especially when displaying the folding. Many folders believe that no tool should be used when folding. However a couple of tools can help especially with the more complex models. For instance a bone folder allows sharp creases to be made in the paper easily, paper clips can act as extra pairs of fingers, and tweezers can be used to make small folds. When making complex models from origami crease patterns, it can help to use a rulerand ballpoint embosser to score the creases. Completed models can be sprayed so they keep their shape better, and a spray is needed when wet folding. The Yoshizawa–Randlett system is a diagramming system used to describe the folds of origami models. Many origami books begin with a description of basic origami techniques which are used to construct the models. There are also a number of standard bases which are commonly used as a first step in construction. Models are typically classified as requiring low, intermediate or high skill depending on the complexity of the techniques involved in the construction. A dashed line shows a valley fold. The paper is folded in front of itself. A dashed and dotted line shows a mountain folds (there may be one or two dots per dash depending on the author).The paper is folded behind itself, this is normally done by turning the paper over, folding a valley fold and then turning the paper back over again. A thin line shows where a previous fold has creased the paper. A dotted line shows a previous fold that’s hidden behind other paper, or sometimes shows a fold that’s not yet made. Turn over and invisible line. The operations shown here are all fairly common. The pleat folds and reverse folds are often done with the two creases at an angle. Reverse folds of a corner are typically used to produce feet or birds heads. The sink fold is considered an intermediary to high skill. The version shown here is called an open sink and there is another version called a closed sink which generates a triangular pocket with no flaps showing. In simple cases the model can be partly unfolded and then folded with the sink in place. Pleat fold, also called an accordion fold. In origami, there is a series of several bases that many models are created with. In general, “base” refers to any folded paper that immediately precedes final folding and shaping of the model-to-be. The ones listed below are generally accepted as the traditional origami bases. A blintz base is made by folding the corners of a square into the center. The resulting square can then be used as the starting point for any base or blintzed again. The resulting base will then have more points available for folding. The kite base is merely two valley folds that bring two adjacent edges of the square together to lie on the square’s diagonal. The Swivel fold is difficult to describe as the term is loosely defined and there are so many different versions that could be called “swivel folds”. However, generally swivel folds involve a flap of paper “swivelling” at a certain point or vertex and another flap or edge of paper, connected to the first, dragged around that point or vertex. Most of the creases in a stretched bird base are present in the regular bird base. When forming this bird base, make sure to crease the triangle at the center corner through all layers. (If you unfold completely, you will see a small square at the center of the paper.) After forming the bird base, either partially unfold the paper, and/or “stretch” two opposite corners of the bird base. These two corners, their associated flaps, and the central square will all lie flat. The other two flaps will form a pyramid. Rabbit ear each flap that is in the pyramid, so that the model lies flat. All of the raw edges will lie along the centerline of the model. The stretched bird base is used in Lang’s Bald Eagle, Greenberg’s Eeyore, and some other high-intermediate and complex models. The spread squash can similarly be considered the sinked analog of the squash fold. It is used to flatten a closed flap or twist fold (see below). Instead of creating a long point to one side of the flap’s base, the spread squash creates a wide splat around the flap’s base. The spread squash is used in the eyes of Engel’s Octopus, in Marie’s Rose, and in some other intermediate and complex models. The closed sink simultaneously makes a locking flap inside of a sink. It is difficult because the paper cannot be opened out further than a triangle. This technique is illustrated in the Origami Forum’s thread #462. The closed sink appears in some high-intermediate and complex models. The twist fold involves, as the name implies, twisting a section of the paper with respect to its original position. The section twisted will be a polygon; the numerous required support creases include pleat folds radiating from its corners. Marie’s Rose demonstrates this on a pentagon.Unsink, or sometimes open unsink, makes a concave pocket convex without fully unfolding the paper, or the opposite of an open sink. It is more difficult than the closed unsink below because there is no internal flap to grab onto to help unsink the paper, so the paper must be opened out and the area to be unsunk is pushed out (to be convex) from inside the model and from behind. It is a common fold in Lang’s insects. It is also possible to twist a single conical point indefinitely, collapsing the sides in a waterbomb-base-like fashion as one goes. (If this is tried with a non-conical point, such as the waterbomb base itself, eventually the fold will terminate in a spread squash.) This variant is used in many of Tomoko Fuse‘s modular boxes.